Each person on the customer service team has it in their power to create a more positive work environment. And that’s good for everyone — the benefits include improved teamwork and cooperation, a happier, healthier staff, and more satisfied, loyal customers. In Contributing to a Positive Workplace, a team of customer service and relationship experts present 15 simple rules to make the work experience more positive. Your package includes 10 copies of the Training Booklet plus downloadable Leader’s Guides and Certificates. They speak directly to reps, and through a range of ideas and styles they will reach everyone on your team. Whether it’s an “ah-ha” moment about avoiding “toxic talk” or about “being fully present in the job,” it’s thoughtful advice that can change attitudes and behaviors. Do you look forward to seeing your coworkers each day, or do you dread going to work? Do you get along with almost everyone in your department, or are there certain people you avoid? Is the atmosphere in your workplace relatively relaxed, or do you sense a simmering, low-grade tension? Hopefully, you are nodding “yes” to the first part of those questions and you are working in an environment that you enjoy. But even in the most pleasant work environment there can be difficult times, especially when you are dealing with a fast-paced service environment where metrics are being measured carefully, calls are being monitored, management has high expectations, and customers may be irritable, demanding, and angry. Fortunately, everyone has it within his or her power to contribute to creating a more positive work environment. After all, you don’t have to be a manager, department director, or anyone’s boss to be a good leader. And everyone can lead by example when it comes to maintaining a positive work environment. Best of all, the same tools and skills you use when dealing with customers can be used just as effectively when dealing with coworkers to create a more respectful and supportive work environment. And that, by extension, contributes to creating a more positive experience for customers. 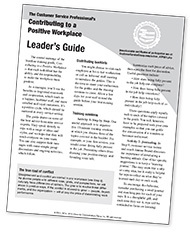 In this booklet, we’ll explore 15 steps that you can take individually or as part of a workgroup to create a more positive environment. You may be surprised to find that we haven’t included a lot of the typical advice and guidance on how to “get along.” Instead, you’ll find advice from a range of industry experts on how to look within and better understand your own emotions, motivations, and behaviors and how they contribute to creating a harmonious culture. When you practice these behaviors, there’s no need to be reminded to say “Thank You” and “Please.” It is just part of a respectful work environment where everyone gets along. In Step 9, customer service trainer and coach Joanna Brandi discusses the importance of developing a learning attitude. One of her specific suggestions is to keep a “learning journal.” This may seem like a silly or corny idea, but it really is helpful for reps to reflect on what they’ve learned each day or each week. To encourage this behavior, consider purchasing a small journal and matching pen for each of your reps. It is a thoughtful gift, and each time they see it, reps will be reminded to focus on learning. The concept of the learning journal can also be modified to a “pride journal” in which reps note “What I did today that I can be proud of” (see Step 6). Or a “Make someone’s day journal” (see Step 7). The point is to actively focus on the positive things that happen every day. Contributing to a Positive Workplace is guaranteed. We want you and your reps to use this valuable resource and put its ideas to work in your department. Then, if you are not 100% satisfied, you may return your materials within 30 days for a full refund.